In addition to its trademark horsemanship program, Hill Country Equestrian Lodge offers the following outdoor, interactive family activities. Parents are invited to join in the fun! Children of all ages are invited to join in our Nature Photo Safaris. Participants are given brief suggestions on composition and light, while the main emphasis is to encourage each one to experience the unique fossils, plants, animals of this area through their own eyes, and to record them in their own individual way. The Lodge will provide cameras, developing, and a personal photo album in which each participant may take home their treasured images of their experience here. $15 per person. Fossils hunts are conducted on a regular basis for guests of all ages. Examples are shown and instructions are given to participants to help them recognize and identify their findings, which they may take home with them. Everyone is guaranteed to find a fossil! Free to all Lodge guests. Star-gazing parties are held on week nights as weather permits, taking advantage of the ranch’s brilliant night sky. On a clear night, there are thousands of stars visible here which cannot be seen in more populated areas. Constellations are identified, and details viewed on the moon and certain planets. Free to all Lodge guests. Animal trackers is a weekly course of exploring for and identifying the tracks of the varied wildlife that inhabit our ranch. Participants are lead by a guide to watering locations where wildlife leave their tracks behind. They then make molds of their selected tracks, which they may take home as mementos of their nature experience. $5 per person. For the creatively minded, the Lodge offers classes (by reservation) in Natural Arrangements, collecting and utilizing the abundance of natural plants and materials available on our ranch. Great fun for creative people of all ages, and of course, participants may take their creations home with them. $5 per person. 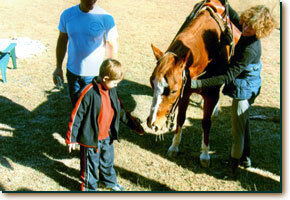 Through the Lodge’s Horse Care Course, children learn about the care, nutrition, and proper handling of horses. Participants help with daily horse-related chores of feeding, grooming, handling, and stable care, and receive a Certificate of Completion. This is an especially valuable tool for parents whose children are begging to own a horse, but who may not understand the effort required to maintain these animals. The Horse Care Course is free to all Lodge guests. The Lodge continues its renowned Whole Horsemanship Program which includes English and Western style riding lessons by reservation, and guided rides on the Lodge’s select group of beautiful, well-trained horses. This Spring we are also offering an hour lesson in Natural Horsemanship Ground Games. 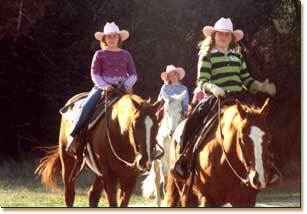 Riding lessons- $60 per hour, $30 per ½ hour. Guided trail rides, caringly lead by experienced guides at a pace appropriate to the riders’ skill level. No more than 5 riders per group. Brief instruction is given before each ride, and along the trail. This is a very different experience than the typical “dude” trail ride- $30 per rider per hour. Natural Horsemanship Ground Games- $30 per participant- ( 1 hour session). While the kids are out and about, parents may indulge themselves with a massage, facial, or other spa service in the privacy of their cabin. Fees for spa services are listed under the our Spa Services link. And, of course, the Lodge’s Jacuzzi Under the Stars is open 24 hours a day. Reconnect, reflect, and rejuvenate with your family at Hill Country Equestrian Lodge! Riding Clinics Summer Riding Camp Our Horses, Our Stars!